The deal to bring Kasey Kahne to Hendrick Motorsports is so full of holes that if it could walk, it would whistle. No employer in any other line of work would dare offer a prospective employee the kind of incomplete deal Rick Hendrick is offering Kahne. And any employee who would sign the kind of half-baked contract Kahne has signed would likely be sued by his heirs. 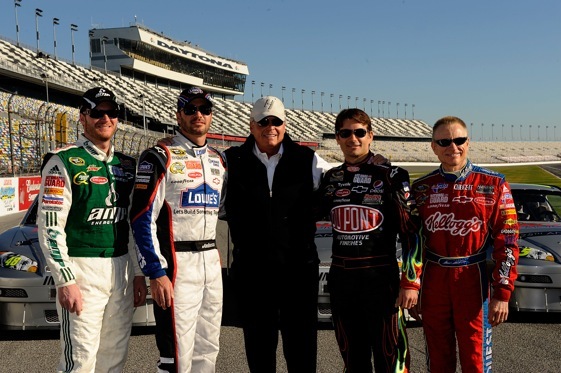 But done the deal is and for one simple reason – it’s Rick Hendrick doing the offering. During an hour-long teleconference with the media on Wednesday afternoon, Kahne summed it all up in on 1.2-second long statement. “You dream of driving for Mr. Hendrick,” Kahne said. Powerful stuff the allure to drive for the team of the guy whose employees – among them two four-time Sprint Cup champions – affectionately refer to as Mr. H.
So powerful, we learned Wednesday, that Kahne jumped at the chance to put his NASCAR career in limbo for the opportunity to have Hendrick sign his paychecks. Kahne signed a multi-year deal with HMS. But, Kahne will likely not climb into an HMS car until 2012. He will spend the 2011 season driving, well, that he does not know and will ultimately depend on Hendrick. Because of NASCAR rules, team owners can own only four cars and Hendrick already has four. Mark Martin, the driver of the No. 5 car which Kahne will inherit in two years, has a contract which runs through the 2011 season. So where does that leave Kahne, whose current contract for Richard Petty Motorsports ends this year, next year? It leaves him in the hands of the Rick Hendrick Employment Service as Hendrick said Wednesday that he himself is the one who is responsible for placing Kahne for 2011. “It’s on my shoulders,” Hendrick said of finding Kahne a ride. Hendrick said he has no real time table for hooking the 30-year-old Kahne up for 2011, which is now just eight months away. All he would say was that there were “tons” of options. Hendrick said he has not spoken to anybody from Stewart-Haas Racing – a team which has strong ties to HMS and only two cars – about putting Kahne in a third car. Both Kahne and Hendrick said that they are not sure who will sponsor the No. 5 in 2012. Budweiser? Go-Daddy? Could be either or neither they said. Who will be the crew chief? Alan Gustafson? Kenny Francis? Perhaps one of those two. Would JR Motorsports, which is co-owned by HMS driver Dale Earnhardt Jr. and Hendrick, considered moving from the Nationwide to the Sprint Cup series and put Kahne in a car? Not discussed. Might there be some circumstance which would cause Martin to retire from full-time racing in the No. 5 car at the end of the current season? Not likely. Where does it all leave Danica Patrick? Not sure. Time and time again during the teleconference, Hendrick and Kahne took turns saying – stressing – that the deal came together so quickly that key details have not been considered, much less ironed out. It’s all kind of unbelievable. In this age in which handshake deals are not worth the paper they are written on, in a time when leaps of faith in the business world are routinely rewarded with high speed plunges to the bottoms of rocky chasms, it is inconceivable that two parties would enter into this kind of multi-million-dollar, career-determining deal. But this is racing and this is Mr. H.
There are many dozens of drivers out there in NASCAR who today are both angered and jealous. Their jobs just got tougher and their dream job just got taken.